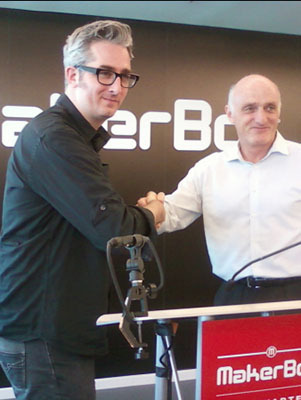 MakerBot/Stratasys Merger: What do you Think? Stett Holbrook is editor of the Bohemian, an alternative weekly in Santa Rosa, California. He is a former senior editor at Maker Media. The potential for 3D printing to go mass market continues to gain momentum as industrial 3D printing giant #Stratasys buys #MakerBot. So proud of the MakerBot team and buckled up for an exciting adventure into a bright future with Stratasys. Congrats to @bre & @makerbot. Proud of an NYC startup that’s been thoughtful, innovative & meaningful since its start. What do you think of the MakerBot/Stratasys deal? Do you think it’s a smart move by Stratasys? What does it mean for the growth of consumer class 3D printers? What does it say about the compatibility of open source hardware and big business? Let us know in the comments below.